Quinton is eager to please and rarely gripes about any request/order given to him. He might only question an order when there is no obvious good to come of it. For example, he justifies the theft of supplies by telling himself the supplies can be better put to use elsewhere. But if someone were to tell him to harm someone simply on a whim, he might openly question the action and, if feeling he must act, might alter the outcome to achieve the result with the least damage/impact. He’s bashful and unlikely to talk about himself, not seeing himself worthy to talk of his accomplishments or abilities, especially in “mixed company”. As such, he can often come across as nervous or insecure when put on the spot. 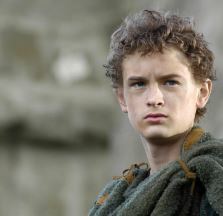 Little is publicly known about Quinton prior to squiring for the aged knight Ser Garland Hobbs,who earned notoriety for serving in the Raven’s Teeth and was severely wounded at the Battle of Redgrass Field. As an “honoraium” for his service and in light of his essentially career ending injuries, Ser Garland was made a quartermaster, at which time Quinton was placed in his service. Quinton served Ser Garland for nearly two years before his unfortunate, but not unforeseen passing, due to complications with his injuries. While Quinton did not learn much in the way of combat from Ser Garland, he received a great deal of education in the unscrupulous procurement of items. As an army marches on their stomachs and morale is only kept with certain creature comforts, all of which Ser Garland was responsible for maintaining, Quinton was often tasked with retrieving items at Ser Garland’s request, often without permission from the other parties. The young man made a name for himself as a sticky fingered servant of Ser Garland. It was also during this time he received his unfortunate nickname, ‘Quiver’, as a passing reference to his prowess with bow and arrow, but more a dig at a certain instance where he was caught pilfering wine from Ser Lemuel Strickland. Quinton was placed in the pillory and flogged for his insolence, a public display that saw him weep and cry, but never divulge what had prompted him to attempt to steal such items.